Yesterday, I promised you a little Ebay round-up, and I'm happy to report I've got some sweet finds for you in a variety of sizes. From pre-owned Lanvin and Marni ankle boots to an assortment of Rag and Bone jeans, there are shoes and skinny jeans for all at way below retail and even sale prices in some cases. You can click on the photo above or HERE to be taken to the full Ebay collection. And what would jeggings and ankle boots be without a giant fisherman sweater? Hmm? They would be nothing. I've been obsessing a little bit about fisherman sweaters (which totally count in my New Year's Shopping Needs as a neutral sweater! ), so I wanted to share some of my faves with you. 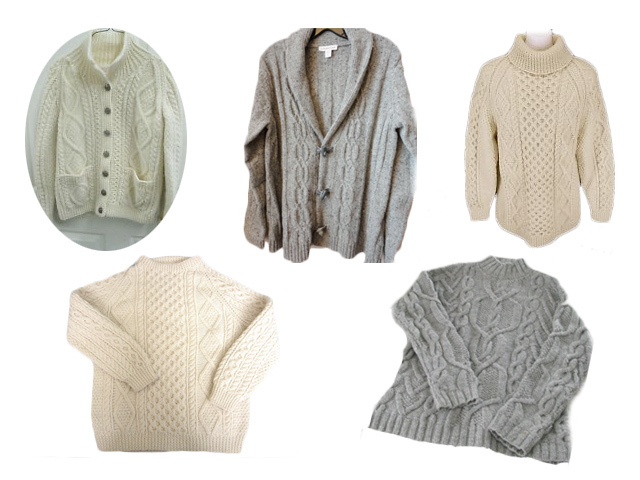 Each one of these sweaters are either vintage or pre-owned, and most are made in Scotland or England of 100% wool. You can see the collection HERE or by clicking the photo, as above. Follow me on Pinterest for more ethical style finds.